HOT DIGGITY DOG! HOT DOGS! - FINALLY! magazine 55 plus Magazine, Generation X Magazine, Baby Boomer Magazine and Senior Citizens Magazine The Premier Magazine Just for Me! HOT DIGGITY DOG! HOT DOGS! HOT DIGGITY DOGS! HOT DOGS! I don’t know about other Countries, but the United States Of America loves their hot dogs. And why shouldn’t we? They’re filled with all kinds of stuff that’s halfway not good for you, all tucked into a cooked, bready tube of dough and then smothered with all kinds of everything and then devoured and enjoyed by the best of them; now that spells d-e-l-i-c-i-o-u-s in any Country. Hot dogs are for everyone! Any age, any country, any time. Think of those stuffed wonders as sausages and maybe you’ll even find a new way to enjoy them. There are so many kinds of hot dogs and known by so many different names. Wieners, dogs, pups, frankfurters, franks, all pork, all beef, all turkey, all chicken, all tofu, all soy, etc. Then there are the brands available: store-name brands, Oscar Meyer, Hebrew National, Farmer John’s, Dodger Dogs, etc. ; after mentioning Dodger Dogs, no other hot dog brand needs mentioning. It has been my personal experience, as eating is an experience, and a learned and sometimes Pavlovian experience, my taste buds and entire being most enjoys a Dodger Dog. Dodger Dogs are named after the world class baseball team, The Dodgers. Tut-tut, not the Brooklyn, but the Los Angeles, Dodgers. This delicious dog is served at the famous Dodger stadium and is filled with memories. When at the stadium, just be sure to go to the food box before the 7th Inning stretch, when everybody goes. The condiments at the Stadium are basic, mustard, ketchup, onions, relish. Who needs anything more? Really. They have it down. And judging by the jars, mustard and ketchup out rank the other condiments. According the Nation Sausage Association, the most popular condiments are, in order, mustard, ketchup, and relish. During our traditional summer season, one of our favorite foods to bar-be-que is the hot dog. The bar-be-que grill is usually most called upon for this chore, although I have been known to cook up a wiener or two in the skillet. To cook a great grilled hot dog, get your grill nice and hot and then place the dogs on it. Let the marks gently appear, then rotate. Place the hot dogs buns on the warmer rack and then during the last and final moments, set the open bun down on the grill for a golden toasting. And then after just a couple of flips, voila, the hot dog’s done and the buns lightly toasted and everyone is ready for all of the condiments. If hot dogs are not the only food you are cooking, cook everything else first, and then at the end, put on the dogs. They only take about 10-15 minutes of cooking. I think the package may say that the contents are already cooked. If you are in the weiner mood and don’t want to fire-up the bbq, although it is a great reason to get outside and enjoy the fresh air, you may also try cooking the hot dog over the stove. Take a skillet or pot and fill it with water, just enough to cover the dogs, then boil the water and then drop in the meat. Watch the temperature of the water though, because too hot of boiling water will only make the casing on the wiener burst. 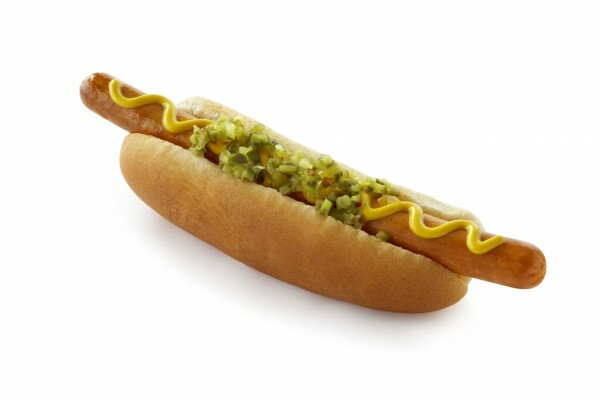 To some an open casing on a dog is a bit distasteful, to others, it just more surface for more condiments. And the citizens of the United States agree that condiments are a necessity on these sausages. Many children like to place their potato chips in the side like a tomato; taste is indeed a matter of opinion. Many adults like chips as a side with a hot dog. The most popular chip with hot dog in my survey was the plain potato chip. Bbq chips ran a close second and the older we are the less frequently we seem to buy those particular delicious bbq chips. Hot dogs are one of the few foods that even the most proper of etiquette will allow you to eat it with your hands. They are also one of the few foods enjoyed served on paper or plastic plates. Whatever your choice of dog or condiment is, hot dogs are delicious, albeit not very nutritious, but they do spell, s-u-m-m-e-r in the greatest ways! Have a hot dog with someone you love, it could make a lasting memory. See you at Dodger stadium…before the 7th inning. Previous : FLAGS. LONG MAY THEY WAVE. Next : RIBS, BABY, RIBS! DELISH AND EASY ON THE BBQ.